Add another first to Caroline Wozniacki’s impressive resume. The Danish tennis darling has reached the final of the Australian Open for the first time after a straight sets win against Belgian surprise package Elise Mertens, 6-3, 7-6 (7-2). After a comfortable first set, the world number two saved two set points in the second, before winning the tiebreak to take the match in one hour and 40 minutes. “I was really tired at 5-4 [her lead in the second set]. I felt like I hit a wall. I started to feel nervous and my legs were shaking,” Wozniacki said according to TV2 News. Actually, Wozniacki was in a similar predicament in 2011. She led 6-3, 5-4 against Li Na in the semi-final of the Australian Open before choking and throwing it all away against her Chinese opponent. This time, she held her nerve. 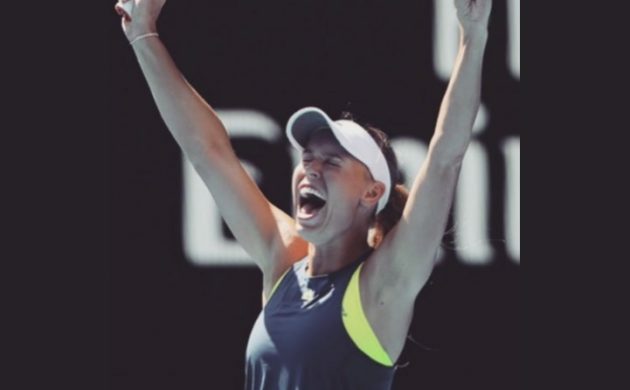 Wozniacki will take on Simona Halep in the final on Saturday January 27, when she will be aiming to secure another first: that elusive grand slam. Had Halep not beaten Angelique Kerber in a very tight semi just minutes ago, Wozniacki would have become the new world number one.